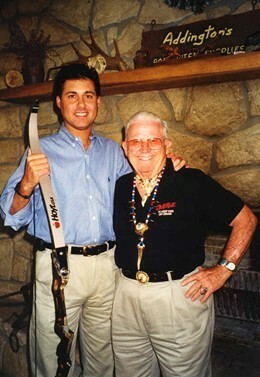 Stacy Groscup was a showman who entertained literally thousands of people with his shooting abilities, bow and arrow and blowgun. At one event in Little Rock, Arkansas, he entertained a record 80,000 people who came to watch him perform. 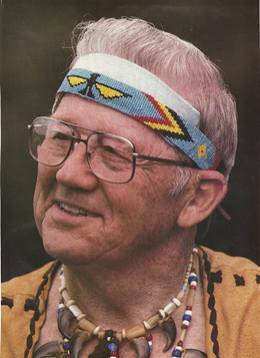 The same year he was inducted into the Archery Hall of Fame he was named "Distinguished West Virginian" by the West Virginia Governor, Cecil Underwood. Stacy was fascinated with Indians and their culture, especially their spiritual beliefs and practices. He lived three years with a Cherokee tribe in North Carolina and then spent time with another tribe in Quebec. He came away with a strong, four point philosophy on life. we should be strong spiritually, mentally, physically, and socially. Stacy had all these qualities. Although my father actually started me shooting a bow instinctively at four years old, I have dubbed my method "The Groscup Method" in honor of my friend and mentor the late Rev. Stacy Groscup. A humble Methodist minister from Morgantown, West Virginia Stacy was a great shot with a bow. Any bow. He was the first man to hit an aspirin tablet from mid air with a bow and he was the only archer to ever hit seven pills in a row, that remains a world record. He did that record shot in the 1980's in front of national TV. In 2004 he signed the 7th arrow he used for that shot and gave it to me. I also have many other things that help me remember my old friend and second father. Stacy always called me his second son, and we laughed about it. My parents did not mind sharing and Stacy and I were close my entire life. Now that he is gone I want people to remember him and read about him. I guarantee Stacy had a positive impact on anyone he ever met. There was only one Rev. Stacy Groscup. His father baptized my father when dad was born and I grew up watching Stacy's amazing shows. I even tossed targets for him at a number of shows. When I turned 18, he took a Pepsi can and tossed it into mid air and challenged me to hit it. I did and that same day he put me in front of an audience shooting aerial targets. Stacy preferred the shortest bow he could get with the arrow as close to his knuckle as possible. 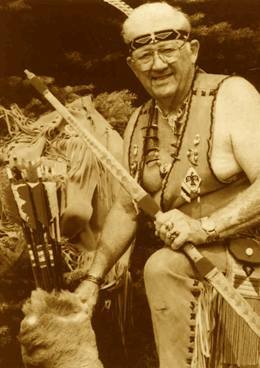 Fred Bear liked his arrow near his knuckle too. However I have seen Stacy shoot an Onieda eagle, longbow and longer recurves with the same accuracy. Since he was not a tall man, he liked the bows short. He could shoot anything with a string on it. He had an extensive bow collection, everything from antique Turkish coathanger bows to the most modern Black Widow or Zipper. Golden Eagle even produced a limited edition bow via Zipper with Stacy's name on it and they also made a video in the 1990's featuring Stacy. When the Archery Hall of Fame inducted Stacy as their 49th Inductee, I was very pleased to have been the one that got the nomination packet together. It was the least I could do for this great man, As humble as Stacy was he was very honored to be recognized by the sport he loved so much. I loved seeing him at the podium accepting the award and speaking to the group at the ATA dinner in Indianapolis. When we got back to West Virginia the Governor honored Stacy with the Distinguished West Virginian Award and the WV Senate had him on the floor of the Senate and recognized him. The West Virginia DNR also hosted a small party for Stacy at their headquarters at the Capital. The morning of the Governor's award Stacy met me at Pops archery shop. We presented Stacy with a Mathews MQ 32 bow. A member of the media was there to interview Stacy. I had told them he would be available for interviews but would not have time to shoot. The next thing I know Stacy has the brand new MQ bow has never shot outside and a reporter filming him shoot discs out of mid air with it. Now keep in mind Stacy had just driven three hours and was 78 years old. He hit the aspirin the FIRST shot for the camera. I was amazed and I had watched him shoot my entire life. After the shot, Stacy grinned, said we better go and put his sport coat back on and we left to meet with the Governor. Just another day for Stacy. I mentioned the feat later that day when I spoke at the Governors ceremony. I could tell you a lifetime of similar stories about Stacy. Having shared the stage, hunting camps and practice range with him my entire life I can attest to the fact that he was the most consistent instinctive shooter to ever draw a string. I am not taking away from any of our sports legends, living or past, and I consider myself a fair shot, but of us all---instinctive shooters and exhibition shooters, there has never been another like Stacy. He could hit aerial targets from his stomach, his back, at a full run, or in a variety of positions, and was able to maintain his accuracy through old age. When he was 82 he joined me on stage and hit the aspirin the 7th shot. How many of us will even be able to see an aspirin airborne at that age? Stacy played a big part in my life and is one of the reasons I do what I do. He was one of those role models that impact your life and remain unforgettable. The following is taken from an article written by Frank Addington Jr.
"Stacy taught me that life, like the seasons, was a circle, a never ending circle. Stacy was larger than life and was a legend in the archery world. However he was a humble man, who had fished with the President of the United States, spoke and performed in front of thousands, and yet always had time to speak to a child or a stranger. His warm smile, gentle manner and outspoken kindness were his trademarks. He touched so many people." Shot Aerial Targets of All Sizes While Lying on His Back, Stomach, Running, Kneeling, Etc.